For eSports fanatics this November was an exciting month. We reviewed the new EA FIFA 18 game, featuring Ronaldo on the front cover. 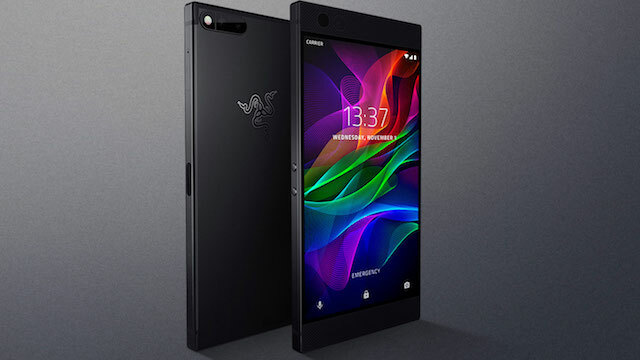 Now we take a look at the brand new eSports players’ phone, the Razer Phone. This is one of the few phones designed specifically for eGamers, and it doesn’t disappoint in quality of video and audio, though other features like the camera and battery life could be better. First up, let’s be clear, the smartphone market is a pretty busy one right now, with Apple competing with Samsung, Google and the rest for top spot. So not an easy one to crack, right? Razer have already done some neat stuff for eSports, but this is their first dip into the phones. It’s being targeted at mobile gamers and Android fans. At first sight though, it looks like any other smart phone. As far as design goes, it has a nice chunky feel, with squared edges but a soft texture. The screen size is 5.7 inches, and 2,560×1,440 pixels. The finish is matte black. Meanwhile on the back you’ll find a super-sized Razer logo. But enough of aesthetics. What does this phone do for the eGamer? Well, the refresh rate on the screen is 120 Hz, which means that you get to see more frames per second and your animations are smoother and more visually impressive. All reports from gamers who have tried out this phone say that it’s the best mobile experience they have ever had playing games like Riptide and Reckless Racing. Built into your Razer phone is a Game Booster App that allows you to tweak a game’s settings for better performance. That means if you do want to max up to 120 Hz you can do so without changing the settings each time you start. Razer have also set up partnerships with specific game developers to make games that will play out particularly well on the Razer phone. This should go a long way to improving the profile of this product. Why else is Razer equipped to play eSports games better? Well the front facing speakers are one thing. They are in stereo and each comes with its own amplifier. And in that way they pump out their sound at very high volumes. Meanwhile the battery life of the Razer Phone is around 2 days which is better than some competitors we can think of. This is with a little gameplay mixed with average daily usage. If you play a lot, the life will obviously go down. Moving onto the camera, and this is perhaps one of the most disappointing aspects of this product. After you click to take the picture there is a few seconds gap before the picture is processed. If you move before this happens then you blur it. This happens a lot! Razer say they plan to improve on picture quality in the future. Finally, on price the phone is at £700 in the UK and can be purchased through the Three Network with limited warranty for a year. This is competitive pricing, and not a bad package, but we only really recommend the Razer Phone to die hard eGamers.